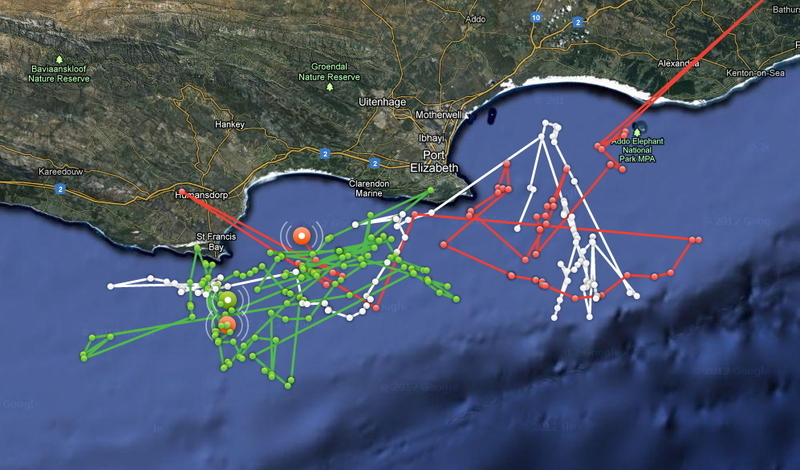 "Lots of evidence is pointing towards Algoa Bay being a nursery area for White Sharks. As much as 70 % of all White Sharks seen in the bay are young juveniles, less than 2.5m in length. No mature females (larger than 4.5 m in length have ever been seen in the bay, and no-one is sure where they actually go to breed or give birth!?). White Shark abundance and distribution appears to be highly seasonal. Abundance at Bird Island increases significantly during the winter, most likely coinciding with the peak period of Cape Fur Seal weaning. Again these are mostly juvenile sharks. There are virtually no Whites seen around that island network in the summer months. During summer, the juvenile White Sharks move inshore, just behind the breakers (no sharks greater than 2.5 m have been seen inshore) possibly to feed on the skates and rays utilising this habitat. Spatially, White Sharks are only seen close inshore on the beaches north of Coega harbour and in the Sundays Beach area, with none being seen on the southern beaches during Matt's chopper surveys (a good sign for surfers sticking to the sheltered part of the bay!!!). All evidence is pointing towards a continuous population of White Sharks along South Africa's coast (i.e. the sharks in Algoa Bay are not locals). Matt is focussing most of his future research towards tagging the Whites (70 have been tagged so far) in a hope to validate these movement and abundance patterns that he's observed (mentioned above). This info will be used to direct beach managers, etc., on beach usage in the bay. Also, with the current proposition to allow a cage-diving permit at Bird Island, Matt's research is going to be the first of its kind to assess the before and after behaviour of White Sharks in response to cage-diving. This may give an important insight into the actual effect of cage-diving on the sharks. This being, of course, dependent on whether the permit gets issued."